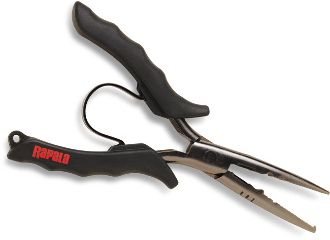 RAPALA STAINLESS STEEL PLIERS These pliers resist rust for years of service. Special fish-specific features not found in other pliers include side cutter, soft grip handles, leaf spring, split ring tool, Rapala tuning tool, split shot crimper, and hand lanyard. 6-1/2" long.